The Bf 109 was a single-seat monoplane fighter which was the back bone of the german fighter force before and during WWII. It was designed by Wilhelm Emil Messerschmitt (* June 26, 1898 – † September 15, 1978) in the year 1934 and was til 1945 continously improved. The german Luftwaffe used it as a fighter, interceptor, high-altitude interceptor, fighter-bomber and reconnaissance aircraft. It also is the most often produced fighter aircraft in history with around 34,000 built airframes from 1936 to April 1945. The G-2 is decently armoured to protect the fuel tank and the pilot sitting on it, but never rely on it. 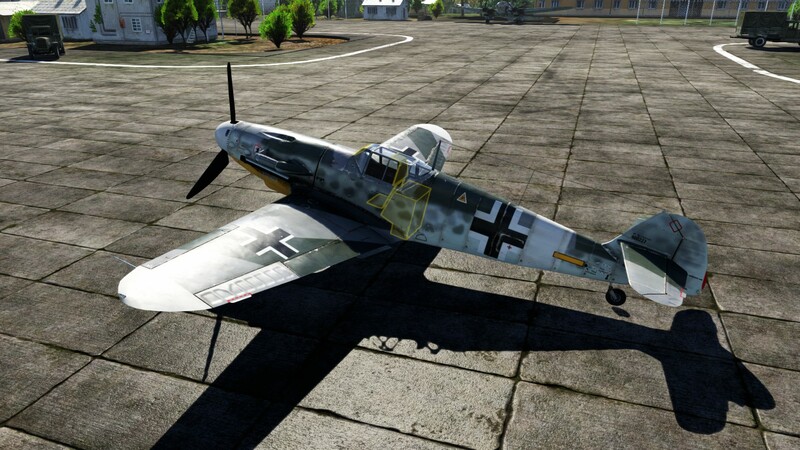 The Bf 109 G-2 fulfills many roles in War Thunder: It can be used as a bomber interceptor and as a fighter bomber but where it really shines is the role as a pure fighter. The G-2 should be flown like every 109 in an energy fighting style. The best climbing speed for the G-2 is 230 km/h (IAS) (alternative 270km/h (IAS) to pull of emergency maneuvers faster) and you should climb from the start with WEP enabled to gain altitude quickly. In a dive red lining starts at 750km/h (IAS) and your aircraft breaks apart around 820km/h (IAS) and til you reach this speed you can not rip your wings off with pulling up. You have access to 20/30/45 minutes of fuel, for most maps 30 minutes of fuel is a good choice. Climb to get and stay high! Keep climbing until you are sure that you are higher than the highest enemy fighter. Then work your way down, start attacking the highest enemy and stop with the lowest. At speeds around 350-450km/h (IAS) the horizontal turning ability of the G-2 is the best and can be further improved with use of combat/take off flaps, but do not rely on it, you will do better in the vertical most of the time. If the one 20mm MG151/20 provides not enough firepower for your taste, have a go with the additional firepower of two 20mm MG151/20 gunpods, but keep in mind they slightly decrease your maneuverability and overall performance. Like for every fighter in War Thunder it is very useful to operate in a squad of four pilots in the same machine to achieve the best results in battle. You managed to achieve an altitude advantage and you are ready to attack your first enemy fighter by diving onto him. Force your opponent to either bail out instantly by some 20mm hits in their wing or if they avoid your attack by defensive maneuvers, also fine because they probably lost altitude and therefore most probably energy. It is crucial to stay patient and not to waste ammunution in long fired bursts or to get wasted in an horizontal turnfigt. Just regain your altitude in a climb and set yourself up for a new attack. If you are the highest fighter you can maneuver quiet aggressively to kill the highest enemy fighter because no other fighter should have enough energy to intercept you while slaughtering your chosen target. A good situational awareness is needed to realize and use such opportunities to their full potential. You screwed it up or the matchmaker screwed it up (e.g. facing Spitfire LF mk IX) and you are below or nearly on the same altitude as your enemies. If the enemy owns the energy advantage, your best bet is to avoid his attacks with simple and energy efficient maneuvers like the Split-S and climb every time you have the time to. But keep in mind: Slow targets are much easier to hit than fast targets, so convert your altitude early enough to speed to avoid an incoming attack successfully. Another option can be to evade an enemy Boom and Zoom attack with a simple downwards barrel roll, when the enemy overshoots you and starts climbing again you have a small time window to fire a burst at him. Most russian fighters (e.g. La-5FN, La-7, Yak-3) outperform the G-2 in almost everything at low altitudes (<4000m), keep that in mind and stay high enough. If they are still higher than you, you might want to try to get them off your tail in a long high speed dive (800km/h) because they are worse divers. If the situation does not allow to dive away, try to lead your six towards your team mates and/or friendly AAA. American fighters like the F4U, P-47 and P-51 are excellent Boom and Zoomers with excellent dive and high speed capabillities, so do not follow them in long dives or high G turns. They are not good turnfighters and are actually turning worse horizantally than you at low and medium speeds. A big threat is the P-63 which is also an energy fighter like the G-2, once it is above you, you will have trouble to regain an offensive position. The Brits especially the Spitfires will outturn you horizontally with ease. Never forget to climb, it is often the 109s only main advantage. The biggest british threat you will face on a regular base is the Typhoon Mk 1b. This fighter consists of 4 x 20mm cannons, a decent climb rate, very good dive capabillities and not bad horizontal turn rates. The best bet to counter this aircraft is in maneuvers which rely on the roll rate of a plane (e.g. rolling scissors), simply because the Typhoons roll rate is bad. Japanese A6M and Ki-43 fighters turn horizontally even better than the Spitfires and are overall very maneuverable. Never engage these fighters in a dog fight. Rely on the 109s superior speed and high altitude performance instead. A big threat for the G-2 are the J2M3 and Ki-84 fighters, both climb and accelerate very good. However the J2M3 performs poor at high speeds (compression) unlike the Ki-84 which is a great diver. But you can beat both in a horizontally turn fight. The german FW190 is an excellent diver with also excellent maximum speeds and roll rates, but an awful horizontal turner and an average climber compared to the Bf 109 G-2. Engaging the FW190 horizontally is often the easiest way to win a dog fight. If you meet another Bf 109 focus it and avoid to lose the energy advantage. When facing any bombers (e.g. B-25, B-17, Wellington, Yer-2) do not just stay behind them and spray your guns all over the bomber. To take out any bomber effectively come in with high speed out of a steep angle and focus your guns on just one wing. This will give the gunners of the bombers a harder time to hit you and if only one wing is heavily damaged most bombers are not anymore capable of doing any maneuvers, without entering a dive which they can not escape anymore. The two MG151/20 gunpods are of course recommended to shoot down bombers faster. To fulfill this role one has the choice between one 250kg or four 50kg bombs. In most situations the 250kg bomb is the way to go, simply because the damage radius is bigger and therefore the bomb is easier to hit. To take out any hard ground target (e.g. tanks, pillboxes) with the 50kg bombs, a direct hit is necessary. The only advantage of the 50kg bombs is that one can drop two at a time and therefore bomb two seperated ground targets. The Gustav-2 has like the Bf 109 F-4 a very accurate and deadly main armament, which is mainly achieved by the engine mounted MG151/20 cannon. The MG151/20 cannon operates at a rate of fire of 800 rounds per minute with a muzzle velocity of 790 meter per second and is capable to shoot one of the most effective cannon rounds against aircrafts: The mighty Minengeschoß (eng. Mineshell), which contains a 20g heavy high explosive filler. The Minengeschoß is in game shown as "HEI - High-explosive incendiary shell (minengeschoß)" and rips wings off with only few hits. It is very likely to hit viable parts of aircrafts like fuel tanks and cooling systems because of the fuse delay which allows the Minengeschoß to penetrate half through wings before the shell explodes. The MG17 machine gun operates at a rate of fire of 1180 rpm with a muzzle velocity of 905 m/s and was used up to the Bf 109 G-4 and then got finally replaced with the bigger MG131 with a caliber of 13mm. The MG17 was derogatively called by german Luftwaffen pilots "Luftwaffenanklopfgerät" (eng. Airforce-knock-knock-thing) due to the small caliber and damage effect on aircrafts. Air Targets: Air Targets (AP-I/HEI/HEI/HEI/HEI/IT) // That is 80% Minengeschoße! Very effective against every aircraft. 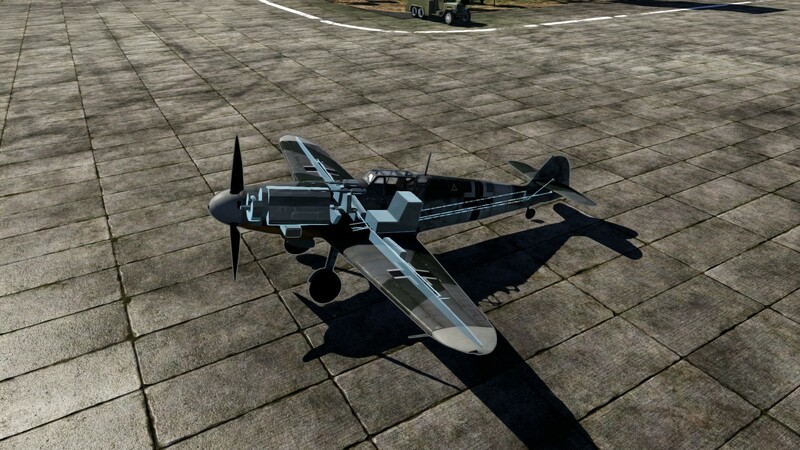 Pilots who are really experienced with the aiming and hitting of the MG151/20, might want to use stealth belts on the MGs and cannons, to avoid being spotted by tracers. Only one of the following modifications can be mounted at a time. It is recommended to unlock all flight performance and survivabilty modules at first, with exception of the weaponry module "Offensive 20mm". Unlock this upgrade as soon as you can, because it gains access to the "Air Targets" ammo belt, which provides significant bigger damage effects than the default belt. The production of the Bf 109 Gustav-2 started in spring 1942 and was the first Bf 109 to arrive combat units with the new DB 605 A engine. The suffix /trop means that this 109 has a special filter mounted to prevent damaging the engine from sand and other particles, which allowed combat use in tropical areas like deserts.The german Luftwaffe used this version in Africa. 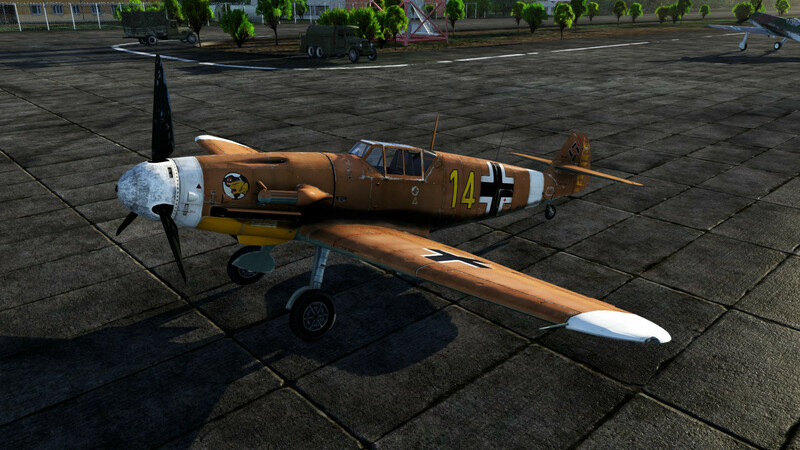 The famous german fighter ace Hans-Joachim Marseille died due to a technical defect in his Bf 109 G-2/trop "Yellow 14". In general an informative article. I personally wished for a bit more information on how to deal with enemies on higher energy, or enemies below 4000m (like La-5FN). I found little. 230IAS is definitely the wrong speed to climb. Your engine will be boiling due the radiator's deficiency at these slow speeds. Further the perfect mix of engine pull and wing lift is at ~270-280IAS this also leaves enough speed for emergency avoid maneuvers. -.- I know, not using "you" is difficult for not naitive speakers (this includes me) but it is considered bad writing. Try to avoid it, when simplicity allows for it. Minor issue. Thanks for the feedback and constructive criticism. I will try to get rid of many you's I can.^^ The 230 IAS is the best climbing speed (look here it was tested: https://docs.google.com/spreadsheets/d/1dlas6VQPcpgoU0bB-Fd0FteJhOEUnl0Hwen665S1HsM/edit#gid=0) but I agree that a climbing speed of 270 IAS is not much worse and gives the option to perform emergency maneuvers quicker than 230 IAS. I will try to extend the part how to counter russian aircraft. Your article has been transferred to the wiki. Your content was very good, the challenge was in "wikifying" the text (for instance, "you" is a word we try to avoid"). It was a pleasure working with your article! I hope you keep on using your knowledge for contests here on the forums. No, I didn't re-do anything, I just redesigned it to make it fit the wiki better.